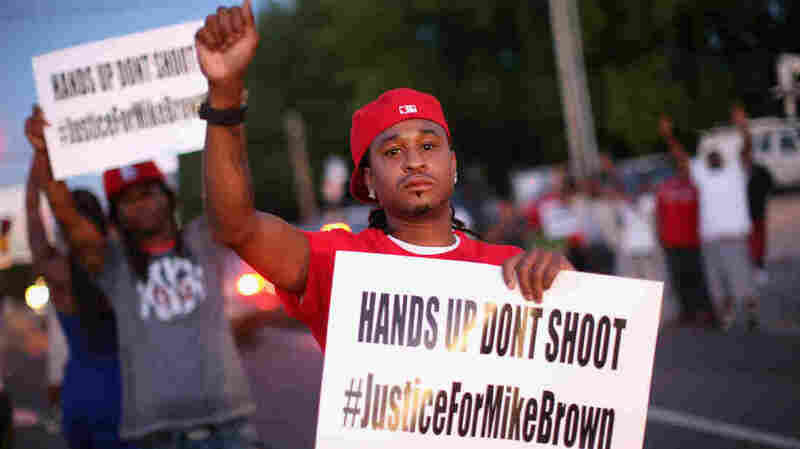 Whether History Or Hype, 'Hands Up, Don't Shoot' Endures A year ago, after a white police officer shot an unarmed black youth in Ferguson, Mo., the phrase "Hands up, don't shoot" became a rallying cry. While it has become a mantra, some call it a lie. Demonstrators in St. Louis, Mo., protest the killing of Michael Brown. No one is certain exactly how the protest chant "hands up, don't shoot" got started, though Tory Russell says he has a good idea. Russell is co-founder of Hands Up United, an activist group which formed after the death of Michael Brown, the 18-year-old black man who was fatally shot by a white police officer in Ferguson, Mo., last August. "It came after Dorian Johnson, the guy that was with Mike Brown, and others said that Mike Brown had his hands up," Russell says. As residents gathered where Brown's body lay for hours in the street, Russell says, a local activist, Brother Anthony Shahid, was on the scene. Russell recalls that as more police came, with dogs and weapons, Shahid said, "My hands are up; don't shoot me." He and others began to chant. "So it's very organic, but it comes actually out of the story of the life and the death of Mike Brown Jr.," he says. The idea of Brown being shot while his hands were raised in surrender would spread like wildfire on social media, and became a rallying cry and a mantra that inspired demonstrations across the country — even as the debate about the accuracy of the phrase continues. The chant was used at a rally last August near the courthouse in Clayton, Mo., where civil rights activist Al Sharpton spoke to demonstrators. "And if you're angry, throw your arms up," Sharpton said. "If you want justice, throw your arms up. If you want answers, throw your arms up, because that's the sign Michael was using." But Jeff Roorda, a spokesman for the St. Louis Police Officers' Association, says that's not true. "Folks that want to cling to this 'hands up, don't shoot' myth, it's just silly," Roorda says. Roorda says he knows that the grand jury investigation, which concluded that Officer Darren Wilson should not be charged, included different sets of eyewitness accounts of the encounter between Wilson and Brown. "But the one set of accounts, including Darren's version of what happened out there, completely squares up with the physical evidence, with the ballistic evidence, with the forensic evidence, with the autopsy, and the other version just doesn't," he says. Following its investigation, the Justice Department issued a scathing report about police practices and the court system in Ferguson, but it also cleared Darren Wilson of any civil rights violations in Brown's shooting death. Then-Attorney General Eric Holder threw cold water on the hands-up scenario. But, Holder added, "It remains not only valid but essential to question how such a strong alternative version of events was able to take hold so swiftly and to be accepted so readily." Montague Simmons, head of the Organization for Black Struggle, a long-time activist group in St. Louis, says there's a reason why the hands-up chant continues to resonate. Simmons says frustration still lingers after George Zimmerman, the Florida neighborhood watch volunteer who shot and killed 17-year-old Trayvon in February 2012, was acquitted in July 2013. "I think it keyed into something that everybody's been feeling for a very long time," he says. "I remember after Trayvon, and after the verdict, people just felt helpless." Ferguson Mayor James Knowles says people are stuck in their positions about the hands-up issue — but the focus needs to be elsewhere. "At the end of the day, we want to make sure that our police officers and our community are safe," Knowles says, "that our police officers engage the community in a way that's productive and respectful; that we can avoid incidents [like the one] that happened, if at all possible." Roorda says a widespread acceptance of the hands-up narrative has caused problems. "Suddenly we have kids that are emboldened, and more than ever are non-compliant with the police and turning violent against the police, and that just means we're going to have more Michael Browns, not fewer," he says. "That is the real tragedy here. Let 'hands up, don't shoot' mean something positive. Let it mean, 'Hey, obey cops; comply with traffic stops.' "
Simmons has a much different take. "Just because I'm black and male, and you may have thoughts that I am criminal or I am a threat, doesn't make it so, and doesn't give you an excuse to kill or injure me," he says. "So I think that the slogan is still valid."